While the headline might seem familiar with the same keywords of Samsung producing 128GB flash storage modules, this story is different from the previous one. Last month, Samsung announced a 128GB storage based on the new and anticipated UFS 2.0 standard and targeted for flagship high-end devices — it made its debut in the Galaxy S6 and S6 Edge. This new module, however, is based on the established eMMC standard and it will appear in mass market mid-range devices. If you missed the previous explanation about the difference between eMMC and UFS, you should know that eMMC is the de-facto standard for storage on smartphones right now. It differs from the swanky UFS 2.0 in two areas: it can't read and write simultaneously and it doesn't have a Command Queue system to sort and re-order the tasks it needs to perform. By comparison, it is slower than UFS, but it remains significantly faster than external MicroSD storage. Samsung's new 128GB flash uses eMMC 5.0 (there's a newer 5.1 standard that is slightly faster), and can deliver sequential reading speeds of 260 MB/s, random reading at 6000 IOPS (input/output per second), and random writing at 5000 IOPS. It is a "value-focused" module and the company's aim is for "mid-market smartphones [to] be able to increase their storage capacity to 128GB." There's no word on when this module will start appearing in phones and tablets, but you should hear about 128GB devices from Samsung and other OEMs later in the year. It's worth noting that Samsung also highlights the speed gains compared to external memory cards in its press release, so you might want to take the hint that the company's devices that will be equipped with this new flash module won't have a MicroSD slot. Financially, it makes a lot of sense given the mark-up difference that added built-in storage incurs compared to external storage. And Samsung can rake in that extra casheesh instead of sending it SanDisk's (or Kingston's or other companies') way. 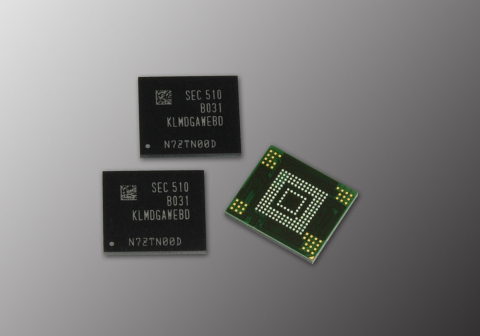 SEOUL, South Korea--(BUSINESS WIRE)--Samsung Electronics Co., Ltd., the world leader in advanced memory technology, today introduced a high-performance mobile memory storage based on Embedded MultiMediaCard (eMMC) 5.0 technology. The new 128-gigabyte (GB), 3-bit NAND-based eMMC 5.0 storage is targeted at the smartphone and tablet mass markets. While flagship smartphones are already transitioning to 128GB memory storage based on Universal Flash Storage (UFS) 2.0 or eMMC 5.1 standards, mid-market smartphones will now be able to increase their storage capacity to 128GB as well. Samsung’s new 3-bit 128GB eMMC 5.0 memory speeds up this transition as the industry’s highest density eMMC 5.0 solution. The new 128GB eMMC 5.0 delivers 260 megabytes per second (MB/s) for sequential data reading, which is the same level of performance as that of MLC NAND-based eMMC 5.1 memory. For random data read and write operations, it can handle up to 6,000 IOPS (input/output operations per second) and 5,000 IOPS, respectively, which is sufficient for supporting high definition video processing and advanced multi-tasking features. These IOPS speeds are approximately four and 10 times faster, respectively, than those of a typical external memory card. With the new 3-bit eMMC 5.0 line-up, Samsung has extended its 3-bit NAND business from SSDs for data centers, servers and PCs to the entire mobile memory storage market. Samsung will continue to broaden its application of 3-bit NAND Flash memory by developing higher-performance and higher-density solutions, as well as strengthening the competitiveness of its memory business.